Come enjoy our beautiful waters. ….and more! A wide variety of fishing, historic sites, and breathtaking seascapes. Known for huge fluke and trophy striped bass, plus many other species for the enthusiastic angler. Professionally qualified Coast Guard licensed Captains with decades of experience. The North Fork is an Excellent Family Vacation Value and a Great Place to Fish. The North Fork Captains Association is a dedicated organization of professional mariners that provide decades of experience to anglers that sail with them. At present, boats sail from Southold, Greenport, and Orient Point. 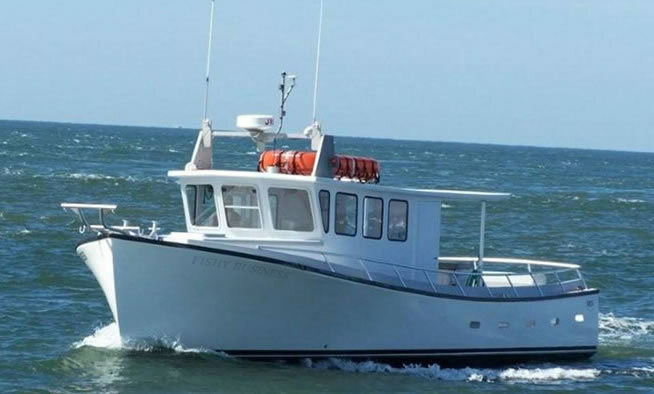 The vessels of the North Fork Captains Association provide anglers with various sailing times, and options for open boat, and private charter excursions that can accommodate fly-casting, or wheel chair accessibility needs. The North Fork Captains Association is devoted to providing anglers with exciting, and enjoyable outings on the beautifully scenic, calm waters, of Long Island’s North Fork. The North Fork Captains Association was formed to provide a place for charter boats to combine their wares and provide the best possible experience for those who wish to come and spend a day on the water. Our captains have been fishing these waters for years. They know the best spots for the best catches. All are certified and licensed – and guarantee your day on the water will provide many years of memories. There’s plenty to do and see out east. Great restaurants, golf and wine country as well. Click here for more of what to do and see. Best fishing ever. Great captains and boats. They know the spots. My kids keeps asking me when we’re going out again. A great family outing, everyone had a great time. Try to get out at least 2-3 times a season. Great catch every time. These guys are pros. They know where, when and how to catch. Never been disappointed.